Kameoka"- Little Kyoto" SUBPAGE | All Japan Kyoto Association"
Kameoka has developed as a neighbor of Kyoto, the millennium city. It is surrounded by abundant natural beauty and is a place where people have co-existed in harmony with the surroundings throughout its history. In the late 16th century, Mitsuhide Akechi, a prominent samurai warrior, built Tanba Kameyama Castle. Today, the atmosphere of the old castle town still remains in the area. The Hozu River valley, which flows near the center of Kameoka, adds to the area’s scenic beauty and visitors can enjoy beautiful scenery by taking the Sagano Romantic Train or trying Hozu River rafting. Yunohana Onsen is a nearby hot spring resort located amongst the peaceful mountains and is known as a retreat near Kyoto. Kameoka has a number of noteworthy attractions and was home to many cultural persons such as Okyo Maruyama and Baigan Ishida, who both influenced Kyoto Culture. This castle was built by Mitsuhide Akechi as a stronghold to suppress the Tanba area. It is famous as the first castle to incorporate a five-story donjon constructed by the master of castle design, Takatora Todo. 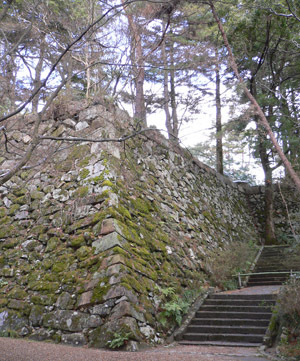 Later, the castle was destroyed and the area is now the property of Omoto, a religious institution, who repaired the stone walls and other structures. The castle town around the ruin still retains the atmosphere of old times and is a good strolling area for visitors coming to Kameoka. *Contact to the reception of Omoto if you wish to visit the castle site. 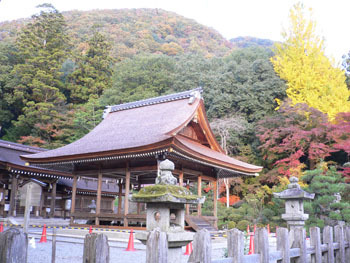 Ichi-no-miya (highest ranking shrine) of Tanba Province has a more than 1,300- year-history. According to legend, the deity of the Izumo Grand Shrine in Izumo Province (present-day Shimane Prefecture) was transferred from this shrine, so it is commonly known as the Moto Izumo (the origin of Izumo). The current main hall repaired by Takauji Ashikaga, the first Shogun of Muromachi period, is designated as a National Important Cultural Property. Many people visit this shrine as they believe that the deity can give longevity, good romantic match-making, and good money fortune. It has also become popular as a spiritual power spot for visitors. It is known as the 21st Pilgrimage Site of Saigoku Sanjusansho (Pilgrimage to the 33 Kannon Temples in Kansai) and has a long history. A wooden statue of the Shaka Nehan Buddha (the enlightened Siddhartha Gautama) is enshrined in the inner sanctuary of the Main Hall and it is said that it has healing powers if one touches the statue on the spot where one feels pain. The garden is also designated as a place of scenic beauty by Kyoto Prefecture and visitors will certainly enjoy the surroundings. 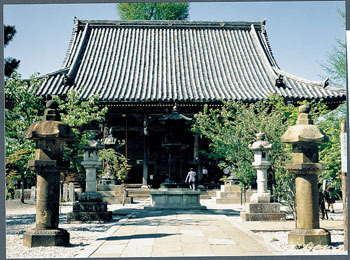 There are seven temples which are closely connected within about 5-km of each other known as the Seven Deity of Good Fortune. This area is popular for tourists as a strolling course for receiving blessings in a short time. 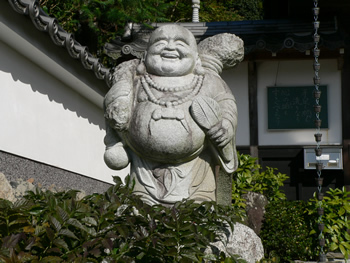 Each temple has its own characters, in particular, Yosen-ji Temple has 500 Hotei (one of the Seven Gods of Good Fortune) statues, so many people enjoy visiting. On the way, is Izumo Daijin-gu Shrine, so many people drop by this shrine, too. In ancient times, people believed that when flowers started to fall there was a danger of plague spreading and this festival began as an attempt to stop it. 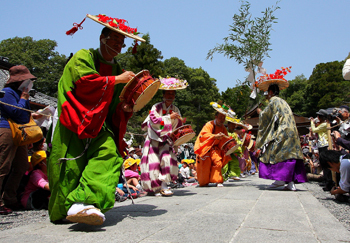 Furyu Odori dancing originated from Shinto rites to pray for rain and now people dance with Hanagasa (a sedge hat) adorned with seasonal flowers. This dance is designated as a registered cultural property by Kyoto Prefecture as Izumo Furyu Hana-odori. 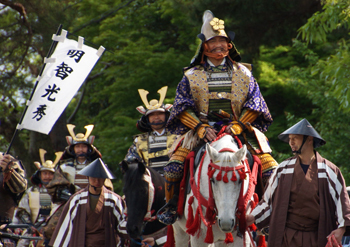 This is a large spring event to commemorate the virtuous character of Mitsuhide Akechi who built Tanba Kameyama Castle. A gorgeous samurai procession in which people play the role of Mitsuhide Akechi and his retainers parades around the entire castle town area. 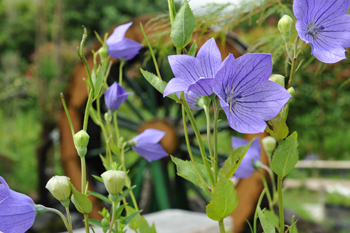 About 50,000 bellflowers bloom everywhere in the “Home of Bellflowers in Tanba Kameoka”. Bellflowers are closely connected to Mitsuhide Akechi since they were part of his family crest. 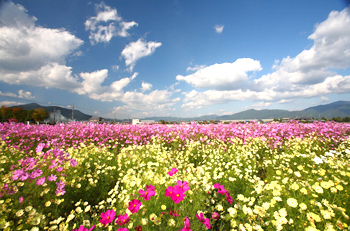 Here, visitors can enjoy pink and double-flowered bellflowers which are so rare in Japan. 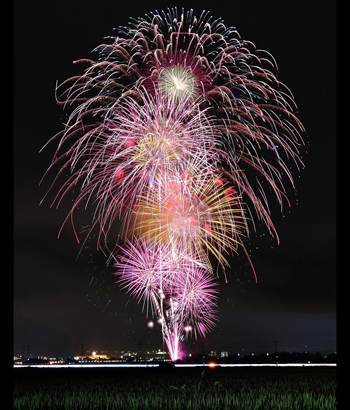 This firework festival is an annual summer event. The festival is held with a wish for peace in Kameoka City where the Declaration for Non-nuclear & Peace City was made by the World Federalist organization. 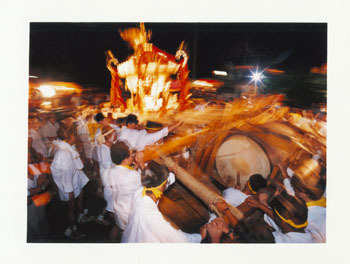 On the 6th, the day prior to the festival, the Kameoka Dance festival (Bon festival dance) is held. This is a festival to pray for a rich autumn harvest. According to legend, it began as a celebration for the delivery of a decorated stone lantern from the Imperial court in the Kamakura Period (1185-1333) and is now designated as an intangible folk cultural asset of the country. In the festival, Joruri Puppet Theater using Kushi dolls (puppet doll) is known for its uniqueness and is highly valued from a historical viewpoint. This is the largest-scale cosmos garden in the Kansai area. The garden contains over 8 million cosmos of 20 different varieties; it is truly a spectacular sight looking out over this never-ending field of so many kinds of flowers. A creative scarecrow contest and the sale of local products are some other fun attractions. 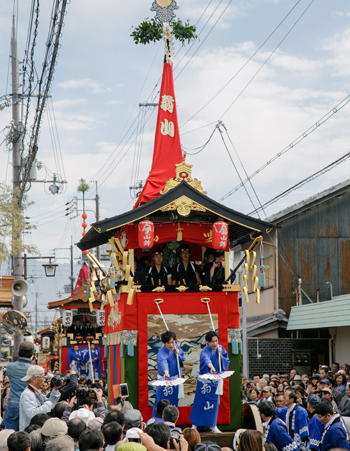 Eleven Yama and Hoko parade floats adorned with imported gorgeous tapestries and big Nishijin brocade are prepared by each town in Kameoka City. Lanterns and Matsuri Bayashi (festival music) warm up the festive atmosphere in the castle town. On the 25th, decorated parade floats are carried by running townspeople and the festival reaches a climax. During this period, the light of lanterns and Hanatoro lanterns color the castle town beautifully. 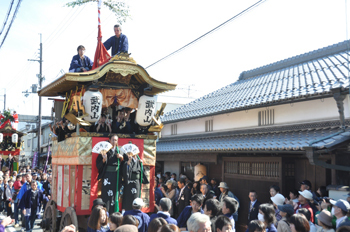 Some other fun events are held during the festival period. 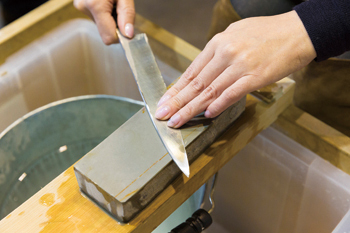 “The Sacred Production Site of Natural Grind Stone.” Kameoka produces a best-ranked grind stones called “Awasedo”. The “Forest Station Kameoka” in Miyazaki Town of Kameoka City opened an exhibition and experience pavilion with the theme of natural grind stones and craftsmanship in April, 2017. Not only various kinds of natural grind stones produced in Kameoka but also grind stones from all over the world are exhibited here. Tanba matsutake mushroom is the highest class and most famous variety of matsutake mushroom throughout the country with a superior flavor and taste. Tanba is also known as a production area of chestnuts which are larger in size and better tasting than other varieties of chestnuts. In the Tanba area, black soybeans and Dainagon Adzuki red beans are also famous products. In particular, the red beans are called Dainagon Adzuki and are highly valued for use in many kinds of food items. Botan Nabe is a local dish of Kameoka and the best season to enjoy it is from November to February, the coldest period, when boar meat becomes juicy and tasty. 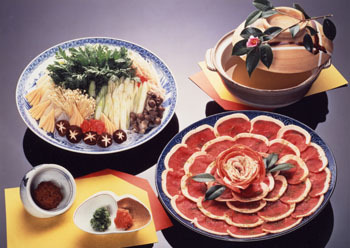 The hot pot is named after the peony flower because the sliced meat of boar arranged beautifully on a big dish look like peony flowers. Agriculture has been prospering in Kameoka since ancient times, and the town has developed as a production area of Kyo Yasai vegetables. People can buy these quality products at ryokan inns and morning markets. The vegetables are brought to Kyoto, too. As Kameoka has been known for its pristine water since the olden days, it is famous as the production area of rich tasting locally brewed sake. Touring some of these sake breweries is one of the popular excursions for visitors. 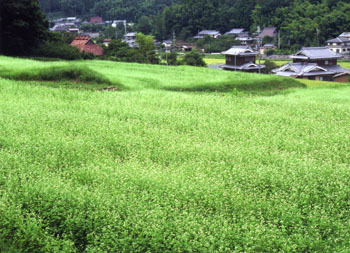 The district of Inukanno in Kameoka has developed as one of the great production areas of buckwheat noodles thanks to the efforts of the local agricultural association. Inukanno Soba noodles have become a Kameoka specialty and are known by many people. It is also known as a sightseeing spot where buckwheat flowers bloom everywhere in autumn.